No Country is 122 minutes long. So it should be fairly easy to examine from a structural standpoint, which is what I’m fixin’ to do. Inciting Incident: At 7:35 into the movie, Llewelyn Moss (Josh Brolin), as he’s tracking an animal he shot, looks through his binoculars to see five trucks and a bunch of bodies lying on the ground a few hundred yards ahead of him on the prairie. He cautiously approaches them, rifle at ready. He pokes around amidst the trucks, finds one loaded with drugs, talks to a severely wounded Mexican who asks him for agua, and then spots the last man standing way up yonder under a tree. Llewelyn walks up to him. The man is dead. But Llewelyn sees the satchel full of money, wrapped stacks of $100 bills. The time is 13:07. Finding the money and deciding to take it sets the entire movie in motion. If he hadn’t done that, none of what follows would have happened. Plot Point I: At around 26:36, Anton Chigurh (Javier Bardem) gets involved. He gets out of his car at the scene where Llewelyn stole the money from the drug deal gone bad. Earlier, Llewelyn (who had gone back to the scene of the crime to give the Mexican a jug of agua) had to flee, leaving his truck behind. At 27:08, Anton pries the serial number off the door of Llewelyn’s truck. With that, he can track Llewelyn down and recover the money. With Anton involved, the movie spins off in a whole new direction. Anything is possible now. But one thing is sure, Llewelyn’s got a ruthless killer on his trail. Mid Point: At precisely one hour into the movie (the perfect spot for a mid point, wouldn’t you say? ), Anton stands outside Lleweyln’s hotel-room door. Llewelyn has been on the run ever since he grabbed the money. He’s just barely one step ahead of Anton, though. This evening, he figures out why. Suspecting there’s more to Anton’s unerring ability to track him, Llewelyn opens the satchel and digs around in it until he finds a homing device. That explains Anton’s ability to track Llewelyn. And now he stands outside of Llewelyn’s door. There’s a bit of gunfire and then some cat and mouse as Anton and Llewelyn seek to do each other in. Both get away, though severely wounded. But this turning point is the Act II push needed to keep the audience wondering what happens next. I’d want to take time to mention the actress who plays Llewelyn’s wife, Carla Jean Moss. Her name is Kelly Macdonald. In the movie, she’s has a little ol’ Texas accent that makes her sound like she truly does live in a trailer and works at Wal-Mart in West Texas. But in real life the actress is from Glasgow, Scotland, and sounds like she just stepped off the moors of the highlands. You’d never guess it was the same woman. She’s good. Plot Point II: At the 1:24:19 mark (eighty-four minutes, nineteen seconds), Llewelyn calls the hotel room of Carson Wells (Woody Harrelson), a bounty hunter on the trail of both Anton and Llewelyn. But Anton just shot Carson. Anton picks up the phone and Anton and Llewelyn have a conversation. Anton says he’s going to kill Carla Jean, Llewelyn’s wife, unless he brings him the satchel of money. Llewelyn tells Anton that ain’t gonna happen – and (at the 1:26:00 mark) – slams down the phone. But not before threatening to hunt down Anton. In a well-structured script, Plot Point II is supposed to be of greater importance than Plot Point I. It ramps up the stakes in the game, makes things as intense as they can be. This one does that just fine. Now Anton is after Llewelyn’s wife. And Llewelyn must track down and stop Anton before that happens. The stakes couldn’t be higher. The movie wraps up with Llewelyn getting shot, Carla Jean’s mother getting killed, Carla Jean getting killed, and Anton getting in a horrific car accident totally out of the blue. Fate deals him a bad hand. With an ugly compound fracture to his left arm, Anton borrows some kid’s shirt, makes a sling with it, and shuffles off down the sidewalk, presumably getting away. 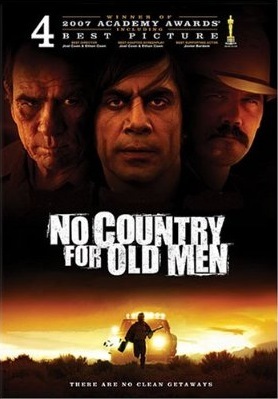 No Country For Old Men was nominated for eight Academy Awards and won four: Best Achievement in Directing (Ethan Coen, Joel Coen), Best Motion Picture of the Year, Best Performance by an Actor in a Supporting Role (Javier Bardem), and Best Writing, Screenplay Based on Material Previously Produced or Published (Joel Coen, Ethan Coen). One of the things I like about movies created by the Coen Brothers is the dialogue. The characters are off-beat and the dialogue is exceptionally well written. Like the scene in this movie (starting at 20:59) which culminates when Anton tells the guy in the gas station to “call it.” The back-and-forth exchanges between the two are hilarious, even though the store owner’s life is on the line. That entire scene is perfect. It only lasts about five minutes, but it establishes Anton’s odd personality, the year the movie takes place (1980), and on what he bases his life or death decisions (a coin toss). If you’re going to create a movie in which there will be lots of violence, take a cue from the Coens. And Mary Poppins. Wrap that violence in occasional humor and it’ll go down nice and easy.